PublicSource in partnership with 90.5 WESA is producing a series on food access and policy in the Pittsburgh region. 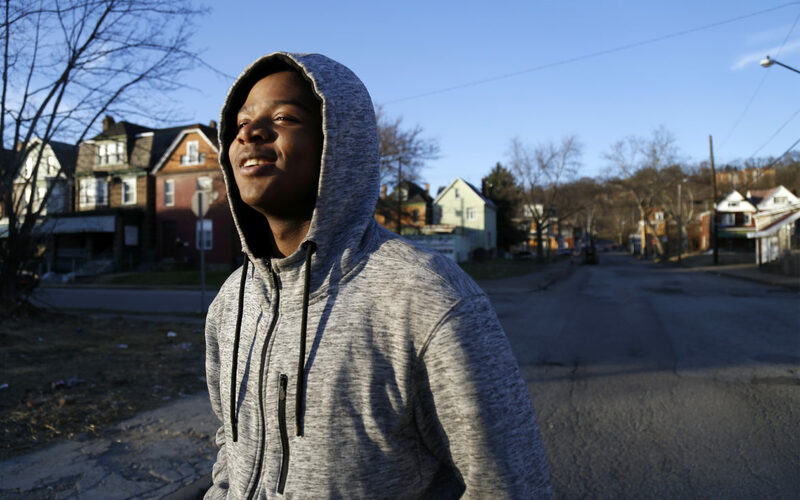 On payday, he and two friends from the Junior Green Corps look forward to heading across the street to Shuman’s All in One, a convenience store and restaurant. There, Maleeke typically orders a cheesesteak hoagie with fries slathered in cheese, and then the boys head for home. "Nobody throws snowballs no more. You been noticing that through the years?” Maleeke's friend, Davon Reynolds Jr., asked wistfully one day after the program. "They talk about it but they don't throw them. It’s like the snow is boring now." The boys’ conversation continued as they avoided the gaze of the people who they say have already started drinking and will still be on the street late at night. They briefly stopped by a neighbor’s house to look at their two favorite dogs before arriving at Maleeke’s house; the boys slapped hands and Maleeke headed upstairs. He navigated an unlit stairwell and plopped onto his bed, where he often naps until dinner. Maleeke's doctor recently told his mom that he was sleeping too much and eating too many noodles. The teen has taken up boxing on Sundays, where coaches told him he needed to shed more than 30 pounds from his 213-pound frame. 90.5 WESA reporter Sarah Schneider and PublicSource reporter Oliver Morrison report on, and compare, the school lunch programs at the Mt. Lebanon School District and Pittsburgh Public Schools. The relationship young people develop to food can affect how they feed themselves and their future families, but there are many factors that affect what young people eat. In a country where obesity among children is at an all-time-high and millions of children still cannot count on three meals per day, several prominent public health policies have emerged to combat the problems. The reality is that some of those efforts either haven’t gotten off the ground (e.g. taxing sugary drinks) or have been largely ignored (e.g. listing calories on fast food menus). And even one of the most popular recent efforts — to bring grocery stores to food deserts — has little impact on what kind of food people buy, according to a January study by the National Bureau of Economic Research. Amid all these setbacks, there is one oft-overlooked tool, which health experts believe could offer students a way to change their eating habits: school food. 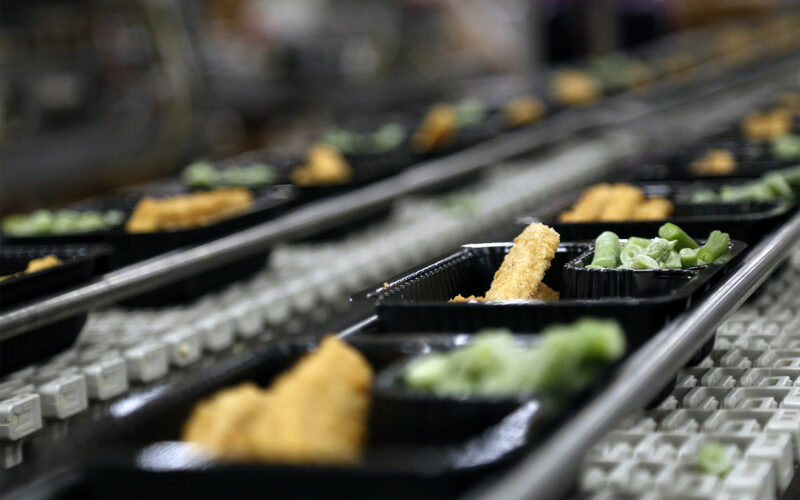 It’s a tired joke to point out that school lunches are bad: the mass production of prepackaged food isn't always appetizing. And it’s widely acknowledged that school lunches had generally become less healthy until federal requirements pushed back, first in 2006 and most recently with the implementation of new guidelines in 2012. Some studies even blamed school lunches for contributing to obesity. Amid setbacks to efforts aimed at improving young peoples’ diets, there is one oft-overlooked tool, which health experts believe could offer students a way to change their eating habits: school food. The new school nutrition requirements inspired hope that school lunch could be students’ healthiest meal of the day. After more than five years, it’s clear that Pittsburgh students didn’t stop eating the school food after the levels of salt, fat and sugar went down. And, because the high rate of students from low-income backgrounds in Pittsburgh Public Schools, the food is free for all. But are the district’s efforts really making kids eat any healthier? The district doesn’t really know. It doesn’t regularly monitor how many kids are actually eating the fruits and vegetables. It doesn’t know if the healthy options are creating habits that lead students to choose healthier food outside of school. And it doesn’t know if students are eating less in school only to make up for it with more junk food at home. With all the unknowns, the effects have to be extrapolated from the complicated lives of individual students. 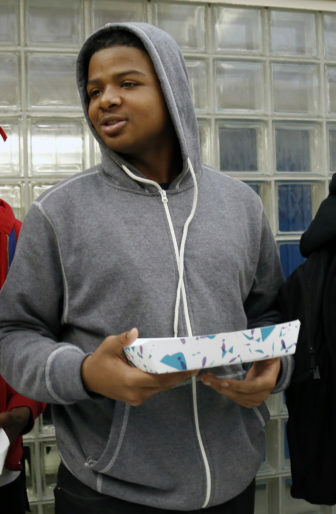 Maleeke’s table of ninth-grade boys at Westinghouse Academy 6-12 is usually the last to get its food. The staff calls students up by tables, and Maleeke and his friends sit on the far side of the cafeteria. As Maleeke reached the cafeteria counter at a recent lunch, he had to make a choice. Every student has to take a fruit or a vegetable. Most choose a fruit, and many of the ones who choose the vegetable don’t eat it. The district has even scaled back on serving vegetables with some meals to cut down on waste. 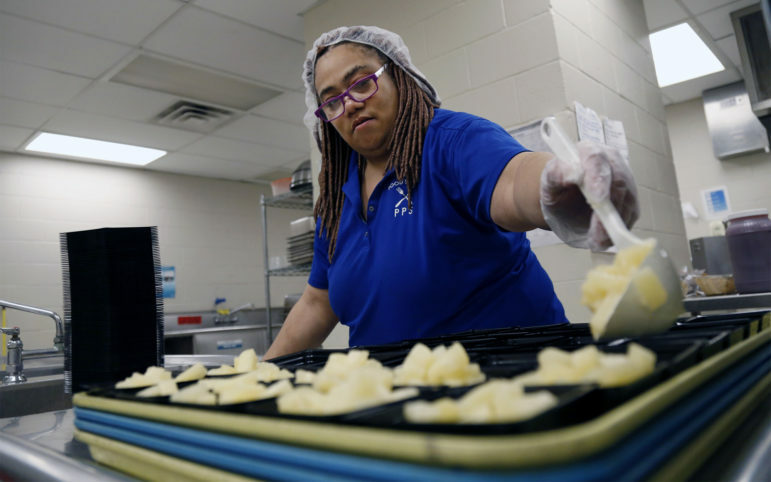 Curtistine Walker, the director of the district’s food service, says it’s even harder to get students to eat their vegetables now that nutrition requirements have forced the district to cut back on the $250,000 they once spent on ranch dressing. A couple years ago, the district trained its cafeteria staff to encourage students to choose more vegetables and fruits. This year, the district was short 20 cafeteria workers. Westinghouse started the year with only three employees to serve about 600 lunches. Westinghouse borrowed a worker from Obama Academy and then, at the end of January, finally hired two more workers. The Obama Academy transplant Lisa Jackson had spent this particular February morning carefully adding strawberries into the cups of cantaloupe and arranging the fruit cups in patterns. The more presentable the fruit is, the more likely kids are to eat it, according to Cornell University research followed by the district. Maleeke grabbed an applesauce cup. A few years ago, the Westinghouse cafeteria had a salad bar but now there isn’t enough staff. Federal standards say staff must monitor what students choose in order for the meal to be reimbursed. As about 200 students in first lunch rushed to get their food, about all Jackson had time to do was send back students who didn’t have a fruit. This was the first day the cook had enough time to cook whole large pizzas and cut them into slices. When they were short-staffed, students were served individual pizzas and some of the kids complained they weren’t cooked evenly. But Maleeke isn’t that picky about the school food: He grabbed the main entree that day, the sriracha chicken, which he called “the chicken balls,” and a strawberry milk. Pittsburgh Public Schools started displaying white milk before the sugary flavored milk a couple years ago. Students are more likely to choose white milk if it’s offered first. Even after the change, six students chose chocolate milk for every one student who chooses white milk, according to a district study from the 2015-16 school year. Maleeke doesn’t even like white milk with his cereal. District Health and Nutrition Coordinator Elizabeth Fisher said that in an ideal world, she would have preferred that Maleeke, and all the other students, choose water instead of milk and take a vegetable or even two. In the real world, she said she’s happy students like Maleeke are sitting down for lunch with a well-balanced meal: in this case, a meat, a fruit, a dairy product and a whole-grain bread stick. While Maleeke took the applesauce, he also bought two bags of Flamin’ Hot Cheetos in the snack line. Although the chips have been reformulated to be healthier for schools, the totality of what Maleeke actually ate for lunch likely no longer fit the nutritional guidelines because of the extra sodium. Although the food Maleeke eats at high school lunch is healthier than what he got in elementary school, it doesn’t look that different. The district still relies on prepared foods, shipped in frozen and reheated. But there are plans in place to change this, too. In the back of the district’s 56,000-square-foot cooking facility on the South Side are two newly installed 100-gallon kettle cookers. That’s where the food for about half of students in Pittsburgh Public Schools is prepared. The district plans to use the kettles to make a variety of meals, from macaroni and cheese and pasta sauce to its own chili and chicken noodle soup. It wants to make school food more like home cooking. And it would also allow the district to create recipes with less salt and fewer preservatives. When the district was larger it prepared more of its meals from scratch, according to workers who have been there since the 1980s. But many large districts like Pittsburgh followed the lead of the airline industry and started buying pre-made food from large suppliers, food that not only was cheaper to make, but also didn’t take as much skill to prepare. The preparation of the food looks more like a manufacturing plant than a restaurant kitchen. Forklifts ferry cases of food up and down elevators. Workers drop in frozen meatballs along an assembly line, which are squirted with tomato sauce before being sealed in a heat-resistant plastic film. The meals are then trucked across the city to 19 elementary schools. Most of the middle and high schools prepare the food in a more typical school kitchen. The food is basically the same as what is packaged in the South Side plant, except for a couple additions like salad and pizza. Because he eats breakfast and lunch at school, dinner is the only true home-cooked meal Maleeke eats during the week. On a Tuesday night in February, Maleeke’s mom, Sikina, had just thrown green peppers and onions into the beef roast. The smell wafted from the kitchen into his room. On most nights, Sikina will rattle his bedroom door knob to wake him up. But Davon had come over to play video games. Sikina learned to cook from her aunt and grandmother, and she doesn’t like other people to use her kitchen. Maleeke said that even when he cooks something simple like eggs, she’ll keep wandering in and out of the kitchen. Maleeke had already eaten his roast, noodles and vegetables and asked for seconds before Sikina could finish serving Davon and sit down herself. These are often the only vegetables Maleeke eats. The night before, they’d eaten broccoli and chicken. Sikina spends at least $400 a month on food. She freezes a month’s worth of meat and cooks most everything else from scratch. She relies on the food bank at the Salvation Army for produce and some non-perishable food. She works as a home health aide and said she earns too much to be eligible for SNAP benefits (the food stamp program). Sam Dienel, a 26-year-old graduate student in neuroscience and medicine at the University of Pittsburgh, is Maleeke’s mentor. He shows up every Sunday at 2 p.m. He’s taken Maleeke to Japanese lessons at the Cathedral of Learning and taught him how to make sushi. Recently, they’ve been boxing together at a gym in Shadyside. “What’s a stone hot pot?” Sikina asked. “You know when you go to Applebee’s and they give us that wood with the metal and it’s still sizzling?” Maleeke said. “It’s like one of those, but like a hot pot heated up." One of Maleeke’s favorite foods is spicy ramen noodles topped with egg and ham, "Asian-style." Maleeke has been obsessed with Asian cultures since he was 4, he said, and he found himself spending time at his grandma’s house watching anime cartoons. He doesn’t remember anything from the year before, when he was 3 and his dad died in a car crash. Sikina signed up Maleeke for football, so he’d have a male presence in his life, even if they were yelling at him, she said, and then she found a Christian organization that connected him with Sam. 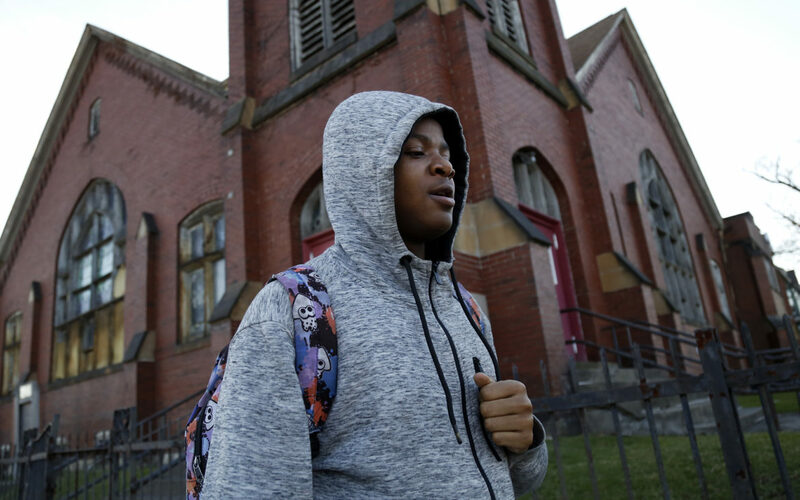 As the meal wound down, the conversation turned toward when they would move into the six-bedroom house she is remodeling near Westinghouse Academy. “When is that, like, two years from now?” Maleeke asks. In August, they moved from public housing into the upstairs of their current home. Sikina said she purchased it with the inheritance from her grandmother and mother. “Uh-uh,” she said. Sikina wants to move into the new renovated house with Maleeke’s 29-year-old sister and her two daughters sooner. Maleeke gets annoyed that his mom is always trying to make him help out with the remodeling. And she has plans for even more. Sikina hopes to turn the first floor of their current home into a convenience store, where she can sell snacks. “I’d give it a year,” she said. This story was fact-checked by Jeffrey Benzing. The Community Kitchen caters, cooks for people experiencing homelessness and has contracts to provide food to five Pittsburgh-area schools. The tension between training its cooks and providing high-quality meals can create challenges, especially as the organization grows. But the Community Kitchen’s success doesn’t only depend on its ability to deliver lunches on time. The food is healthier than typical school lunches, and it has to find schools that can get kids to eat it. Nearly one in seven Allegheny County residents are food insecure. It takes many organizations working in tandem to get them the help they need.